Program chair Wayne Lowery scheduled another wonderful program for this morning's meeting. Assistant Governor Bill Tobin introduced Dan Hiney of Wheelers for the Wounded, and then Bill showed the multi-media piece he made about the last trip. Dan updated us on how they have expanded the program to include vets from Nevada and how they want to expand the program to serve vets in eleven more western states. He cited examples how this powerful program has positively impacted the lives of combat vets. This is the organization's 5th year in Northern California. 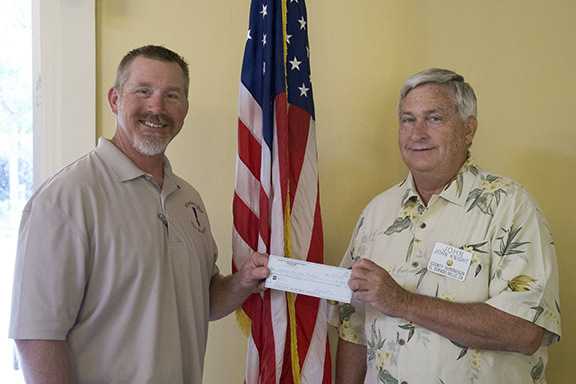 President John Knight presented this year's donation, and Dan concluded by thanking us for our ongoing support over the last five years. What a terrific cause!